Give your felines a private privy with this New Cat Condo litter box enclosure. Constructed from wood with a plush carpeted exterior, this hidden home comes in several colors and is toxic-material free. Fully assembled, is handcrafted in the U.S.A. and is ready to use right from the box. Due to the difference of monitor colors, some colors may vary slightly. We try to represent all rug colors accurately. Please refer to the text above for a description of the colors shown in the photo. If buying two of the same color item, slight differences may be expected. Cats like it, what more can I ask? It is exactly what I expected which is good. Don't kid yourself, it looks like a very over-sized, boring cat condo, but it hides the litter box and that is what I got it for. I keep it under the window so it doubles as a window bench (about 4 inches shy of the windowsill. One thing I wanted to know before buying (but took my chances) were the interior dimensions. So here you go! The walls are ~2" thick and I measured the interior dimensions as 17"wide by ~28.5 long. The height is 16"closed. The cats like it, all 3 use it (at different times) and 1 has taken ownership of the top, loving laying in the sun. So I would call it a success. I have bought two of these boxes. Initially I purchased a blue one (it is a nice, dark, navy blue), and I was so thrilled with it that I bought a green one (forest green) less than a month later. The carpet that covers the box is nice and thick and soft. My cats love to sit on the box top when it is closed. It is also a wonderful alternative to having kitty boxes out in the open air. The boxes themselves simply look like pieces of furniture (the various colors available made it possible for me to purchase colors to match my decor). They also help to minimize any unfortunate but inevitable litter box smells until I am able to scoop the litter, and they have entirely eliminated the thick clouds of clay dust that used to plume up and cover all of my belongings. The dust stays in the box, and there is almost no litter debris from kitty paws anywhere outside the boxes. Scooping the litter is very easy. The tops of the boxes are very easy to lift off, making access to the soiled litter very convenient for cleaning. Also, the inside of the boxes is constructed of a slick, white surface, which is easy to clean and disinfect in the event of accidents. As I said, most of the litter pieces stay inside the box, and I just vacuum them up when I change the litter each week. The opening to the boxes is large enough that even my very rotund, 24 lb cat can enter and exit easily. My cats got used to the box enclosures very quickly and use them all the time. I think they love the extra privacy. I couldn't be happier with these boxes. I have five cats and five litter boxes...as a result of space requirements, two of the boxes are inside the house, and these litter box enclosures have been an absolute miracle. They have made my kitties and me very happy. We got this litter box enclosure in brown -- the color is a darker chocolatey brown, with beige trim around the door. As others have mentioned, it does just look like a big cat toy -- a carpeted cube -- so if you want something that is disguised as nice furniture, there are better choices. But this piece is great for us! -It's sturdy and heavy -- you can sit on it. -The carpet makes it appealing to our cats for play and scratching. -There's plenty of room for litter box -- even our "extra large" rectangular. -Laminated walls inside make it easy to wipe clean in there. -Lid is heavy-ish and lifts completely off (no hinge). -Arrived fully assembled and seems very well made. -Perfect for our bedroom next to their cat climbing tree. Our cats adjusted to it easily. We placed it in our room next to the litter box (already there). We left it empty with lid off for a day so kitties could explore it, then we put the lid on and left empty for a half-day to ensure they were ok with it enclosed -- they think it's a hideout and great fun. Then we put the litter box (which was sitting next to it outside) inside it with lid off. Kitties found the litter and sniffed everything out -- used it no problem. We put the lid on next day (day 2) and they've been using it ever since. They also use it constantly to ambush each other and play king-of-the-mountain, so it's getting plenty of use. A perfect fit for our situation! We like it much better than the plastic-hooded enclosed litter boxes from pet store -- it's bigger and looks better than those. A fine value! Perfect color and size for my corner! Fits a large car litter box. My cat can get away from the dog! Carpet is durable. Wood on the inside is easy to clean. I had been looking for a new large "furniture" piece for my litter box for a while. I had tried a wooden box only to be disappointed in the poor quality as screws easily stripped and got loose and the box fell apart over and over. Furthermore, the box retained the smell of cat urine no matter how many times I cleaned it. The second effort was a vinyl fabric coated hassock like litter box cover. It was sturdy but again the vinyl interior fabric retained the urine odor. When I saw this product, I thought that it was worth a try. As I was taking it out of the box, my largest cat decided that he liked to sit on the carpeted top. They all seem to like that. What impressed me most was the fact that the box did not need assembly, it was good to go right from the time I took it out of the box. Once the litter box went inside, it became the favorite bathroom. What I also liked was that the interior while made of a wood product is coated with a plastic or melamine like substance which makes cleaning it easy. So far it has not retained any urine odor. A quick clean with an enzymatic cleaner seemed to be all it needs. I liked this product so much, I may purchase another to replace one of the wicker type litter box enclosures that i have in another room. I got this enclosure in the gray, and the color on my monitor is accurate for that option. This box is large and heavy, so be warned, as it was overall larger than I was envisioning. However, it was the best option for hiding the litter pan that has to sit in the downstairs living areas where others will see it, and really, anything smaller would not have worked for me. The doorway is the largest I could find. I have an 18 pound litter pan-challenged cat, and he needed to feel comfortable accessing this box. He's still cautious going inside, but so far, so good. I leave the lid off when no one else is around because at just 16" tall inside, that's a little short for him. Since he wouldn't use it with other people around, it's not a problem if I put the lid on when I really need to hide it. I do wish it were slightly wider as it does not fit a large litter pan that also has really high sides. So far, my cat has missed the pan on three occasions, but I think that is just because the litter pan is smaller than he is used to using. The inside walls and floor are well protected; I have not had any problems with cleaning up the urine, seepage into the condo, or residual odor. Also, if you use a long litter pan, the litter will still end up on the floor unless there is something in the box to catch litter when the cat exits the pan. I just opted for a mat on the outside as with any litter pan. Overall, I am very pleased with this purchase. Okay, so this is the best solution I had for my room. Here were my requirements: I couldn't have the look of gross litter, because I can't hide it in my bedroom, so it had to look nice. It does. It doesn't look like an amazing piece of furniture or anything -- but it doesn't distract from anything. And if my cat weren't so old I'm sure she would like to scratch on it or sit on top of it. My other requirement was that my litter tray would fit -- and boy did it ever. This thing is huge. use their measurements to see where you can put this. My cat was a little afraid of it at first, but she got over it and totally loves it now. I think it makes her feel secure. It's easy to clean up -- their is a lot less smell -- I really like it. But please measure. I didn't. I just thought, "Oh, an enclosed cat box" and when it came I was surprised. Also -- I'm not sure what the other colors look like, but g oo gle this in brown and you can see what the brown looks like. I was looking for brown and it is a light brown. We needed to add a litterbox to our middle floor so that our cat would be able to do his business without needing to go down to the basement and be scared by two "new" cats in our household. It is a very large rectangle and the carpeting on it almost matches our floor carpet (beige). We have one of those super big litter boxes and it did fit in there, barely, but it is tight and only leave 4-5 inches of space in the front where we have the scooper laying up against the side. The litter box is right up against the sides of the condo so unlocking and lifting the lid is not easy at all. I guess if you wanted to remove the lid, you could, but we are afraid of litter being kicked every where inside as well as smell leaking out more. Our cat does love to lay on top and look out the window we have it against.....so that is nice too. Very happy with item - absolutely recommend! Sturdy and great color. I really like this as a way to hide the typical litter box. For the size, (it is large and heavy...check the dimensions) it really should be a little wider for a large litter box. I have 2 cats and so have a jumbo litter box. I had to snap off the lock for the lid to get it to fit inside. Also, if your cat misses the box it will get sprayed on the wooden frame inside. Hence, I am glad for the larger box and high sides and back of my litter box. The cat also has to walk through the door and then step into the litter box. It hasn't been a problem but just a word of caution. Overall, I like the way it looks and my cats adjusted easily. I have to keep my litterbox in my bedroom because my precious 15 yr old cat needs to use it frequently, and I didn't like the look of a litterbox sitting in the middle of my bedroom. I found this one and loved the look. When it arrived, I put it right in my bedroom, hoping she would use it. My other kitties caught on very quickly, but she was timid of this new box. Eventually, she got used to it, and we're both very happy with my purchase. It even has room inside for my litterbox scooper and bags, and some of my cats lay on the top of it. I was wondering if the lid would be bothersome to take on and off, when I needed to scoop, but it'FLs very light and no bother at all. Very worth it. This litterbox cover was much larger than I thought it was. My cats love it though and hang out and lounge on top of it. It has become a play perch in my home as well. I have two cats and one sits on top and the other bats it from below. So it's convenient to hide the litterbox and fun for them. I've had this for a few weeks now and it's just great! It really cuts down on the litter scattered outside the box. There is barely any. It holds a large litter box. I change the litter frequently and never notice a smell. It is heavy to move around and is very sturdy. I would definitely recommend this. This arrived yesterday, and wow! It's big, heavy, and substantial, with plenty of room for a litter box inside and room left over. I got this to prevent the dog from "sampling" the cat poop, and I can say that this will work beautifully! I like that it's covered in carpeting to blend with its surroundings and insulate from the smell of the kitty litter. This litter box is awesome. My girls use it to scratch and lay on. It really does a good job of hiding the litter. It fits a litter box and liter in it. Great cover for the kitty litter. It’s kind of in the heavier side but still great. I did not keep it though since it was too big for area I needed it for. 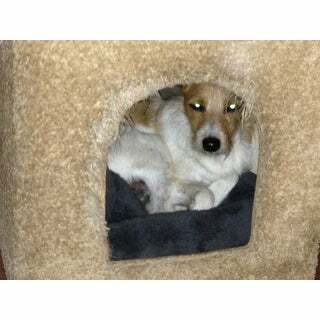 This is the best kitty house...My senior kitty just loves it since she sleeps much of the time. She does like to get upon sometimes. She thinks she is the queen when she is on top of it. The gray color is a nice shade of gray that blends with the other item in the room where we keep it. I would highly recommend this to anyone wanting new digs for the kitty in your family. Great litter box and the cats enjoy it so much that they even sleep in it at times...smh. I have to shoo them out and it seems every time I go to clean the box and vacuum, one has to come and sit in the box and watch. Crazy kitties, lol. The litter stays on the inside as I have a litter rug inside the enclosure and under their litter box, as well as one outside as they step out of the enclosure. Great investment. My cats seem to like it, and it's easy to lift up the lid to scoop the box. Certainly helps to contain some of the litter and odor. A good, solid product. 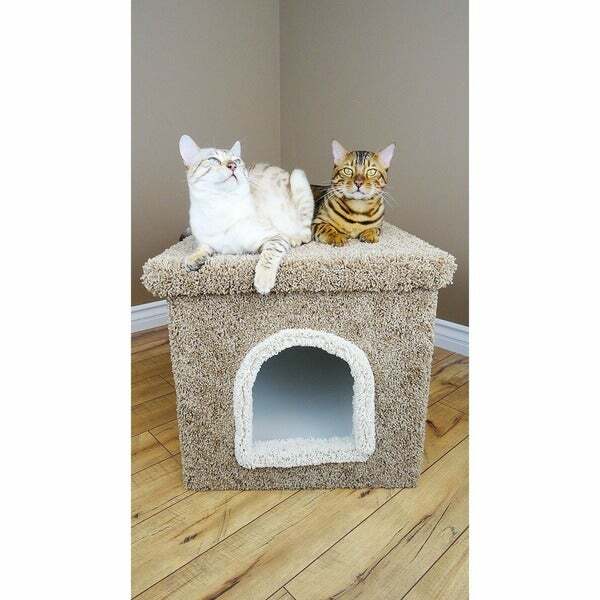 This is a well made heavy duty cat condo, go well with cat tree in same finish. The large is huge, multi cat habitat, or cubbie. Did not like it for litter box as lid is heavy and cleaning interior is constant issue. Would double as a bench as it is well constructed and will hold weight. Goodness did this thing save me a lot of clean up time! My cat has made a habit of throbbing kitty litter out of her box so this has been a blessing in keeping it contained. My only comment about it is that it’s much heavier than you think. If it’s not 50lbs it sure feels like it. The enclosure looks like a piece of furniture. So much more classier than just having a litter box on the floor. I've had mine three years now and just like the ad my cat enjoys sitting on top. "can and automatic litter box fit"
"What size litter box will fit this"
It'll handle a box about 17 inches by 18 inches and still leave room for the cat to get into the condo. "My dog likes to play and eat in my cat's litter box. Will this box keep him out?" 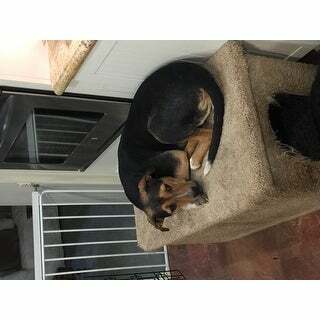 If your dog is bigger than the cat, then yes, this will definitely keep him out. Also, dogs are a little more cautious when climbing into small dark spaces. It keep both my little dogs out. "What size is the smaller box? Will it fit a full grown cat or just kittens? And what size litter box fits for the smaller size?" "How heavy is the lid,"
It's not very heavy, but it is solid and large. My cats love it! "Does this cut down on dust from litter getting all over my furniture"
"Is this delivered already assembled?" Yes, it was already assembled, best purchase for my animals ever!! The inside is coated and cleanable and my cats love to sit on top and look out the window. Yes it was fully assembled and larger than I expected. Often one of the cast sits on the top. Yes it is assembled. Like Cindy all my cats love this cat condo and this is the fourth one I purchased for them.